It was an idea that sparked a passion project at District 711 in Tennessee. A cutting-edge, IAM apprenticeship program for machinists that could be established in one part of the country and then replicated across the U.S.A. This month, that dream became a reality when an inaugural class of 10 students began their path to become Journeymen. 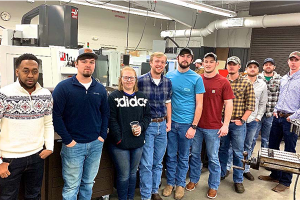 In a partnership with Northwest-Shoals Community College (NW-SCC) in Muscle Shoals, AL, the IAM has established its first apprentice program for students wanting to become certified machinists. Ten were chosen for this life-changing opportunity. “We aren’t talking just about making a living wage here, we are talking about creating a future. About giving these young adults a career path that will change their lives, the lives of their families and possibly, even future generations,” said District 711 Directing Business Representative Jerry Benson. In the end, these students will be licensed Machinists qualified for work on turbines, plant equipment and in nuclear facilities just to name a few, with starting salaries between $25 and $40 and more an hour. District 711 Business Representative Keith McFarland has been spearheading this project since the beginning. He knows, firsthand, what a program like this truly means. And it’s good no one did give up because already, the coals are in the fire to spread this program into other communities across the U.S.A.
Wallace understands distinctly what this program means to the future.